- Publisher God has a story. Worship does God's story.There is a crisis of worship today. The problem goes beyond matters of style--it is a crisis of content and of form. Worship in churches today is too often dead and dry, or busy and self-involved. Robert Webber attributes these problems to a loss of vision of God and of God's narrative in past, present, and future history. As he examines worship practices of Old Testament Israel and the early church, Webber uncovers ancient principles and practices that can reinvigorate our worship today and into the future.The final volume in Webber's acclaimed Ancient-Future series, Ancient-Future Worship is the culmination of a lifetime of study and reflection on Christian worship. Here is an urgent call to recover a vigorous, God-glorifying, transformative worship through the enactment and proclamation of God's glorious story. The road to the future, argues Webber, runs through the past.Robert E. Webber (1933-2007) was, at the time of his death, Myers Professor of Ministry at Northern Seminary in Lombard, Illinois, and served as the president of the Institute for Worship Studies in Orange Park, Florida. His many books include Ancient-Future Faith and The Younger Evangelicals. About "Ancient Future: Worship (Ancient-future Series)"
God has a story. Worship does God's story.There is a crisis of worship today. The problem goes beyond matters of style--it is a crisis of content and of form. Worship in churches today is too often dead and dry, or busy and self-involved. Robert Webber attributes these problems to a loss of vision of God and of God's narrative in past, present, and future history. As he examines worship practices of Old Testament Israel and the early church, Webber uncovers ancient principles and practices that can reinvigorate our worship today and into the future.The final volume in Webber's acclaimed Ancient-Future series, Ancient-Future Worship is the culmination of a lifetime of study and reflection on Christian worship. 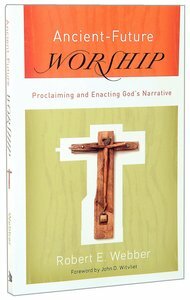 Here is an urgent call to recover a vigorous, God-glorifying, transformative worship through the enactment and proclamation of God's glorious story. The road to the future, argues Webber, runs through the past.Robert E. Webber (1933-2007) was, at the time of his death, Myers Professor of Ministry at Northern Seminary in Lombard, Illinois, and served as the president of the Institute for Worship Studies in Orange Park, Florida. His many books include Ancient-Future Faith and The Younger Evangelicals. Robert E. Webber (1933-2007) was Myers Professor of Ministry at Northern Seminary in Lombard, Illinois, and served as the president of the Institute for Worship Studies. His many books include in five vomes in the Ancient-Future series: Faith; Evangelism, Divine Embrace, Time and Embrace, Worship is a Verb and The Younger Evangelicals. Customer Reviews For "Ancient Future: Worship (Ancient-future Series)"
This is the final book in Webber's Ancient-Future series, though the first I've read and it stands well on its own. The act of worship is described as the community of God becoming actively involved in the redemption story of God and God's people. Through observing the practices of those in the Bible and the early church Webber concludes that worship should both remember the past and anticipate the future, throughout all the practices throughout a service: word, holy communion, singing etc. The other key reoccurring thread of the book is the comparison of different frameworks of viewing the Bible, generally in the west it is viewed as creation-sin-redemption, though Webber has borrowed the eastern orthodox framework of creation-incarnation-recreation. This book was very easy to read, with much of interest, and it flows well. Robert E. Webber's well-received Ancient-Future Faith has become a key resource for "younger evangelicals" and others who wonder how early Christian practices can be applied to a postmodern church. ANCIENT-FUTURE EVANGELISM situates evangelism in the mission and worship of God and explores what church-based conversion looks like, reflecting on its implications for discipleship and spiritual formation. Rooted in historical models and patristic church studies, yet in tune with today's culture, this book will help professors and students of evangelism, pastors, and church leaders examine the processes of evangelism and spiritual formation.